This is a tool for people who buy and/or sell online traffic. Everything should be self-explanatory, but in case you're new to it, here are a few pointers. The two most common models of billing for internet advertising. With CPM advertisers pay based on how often their ad is shown to users. For example, when you buy 10000 visits with a $2 CPM, you'd end up paying $20 for the whole campaign. With CPC advertising, advertisers pay for actual visits to their site. For example, you may agree on $1.5 CPC and this is how much you'll pay for every single click. Once the campaign airs and you see how your ads perform, you can easily calculate CPM from CPC and CPC from CPM via another metric called CTR (click-through rate), which simply means "how often people click on my ads". If you're on the buyer's side and would like to calculate everything that goes into the process (from impressions, through clicks/visits, leads to actual sales), try our online marketing conversion calculator. Also, we have a simple CPM calculator if actual visits aren't your concern. 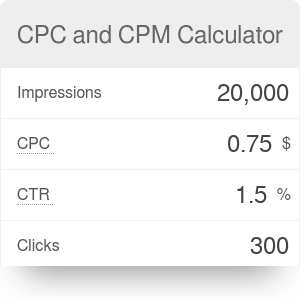 As previously mentioned, CPC is cost per click, so the formula for it is super simple: CPC = total_cost / number_of_clicks. You may also derive it from CPM and CTR: CPC = (CPM / 1000) / (CTR / 100) = 0.1 * CPM / CTR. Nowadays, it's common that the model is not as straightforward as the one you see here. Advertisers often compete over the ad placement in a real-time bidding auction. Special algorithms take multiple factors (the CPC bid of each ad, its performance so far, what they know about the user) into account and try to predict actual revenue for every impression. Again, this is a simple percentage formula: CTR = 0.01 * number_of_clicks / number_of_impressions. It's divided by 100 because it's expressed as a percentage. It's always a dilemma whether to pick CPM or CPC. CPC is more closely tied to the value that the traffic brings. Going with CPM has its merits, too - it's more predictable for the publisher. It's possible that visits don't interest you much at all - you may treat display advertising as a way to increase brand awareness. CPC and CPM Calculator can be embedded on your website to enrich the content you wrote and make it easier for your visitors to understand your message.